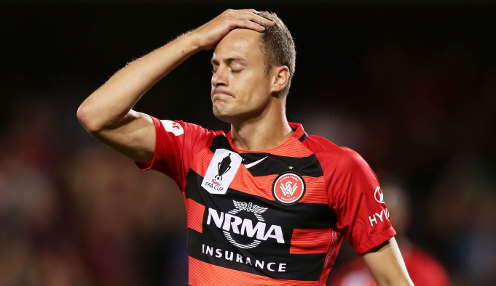 Two goals from Oriol Riera helped Western Sydney turn things around at Suncorp Stadium as they beat Brisbane Roar 4-1. Wanderers, looking to stretch their unbeaten run to four games, fell behind inside the opening eight minutes. After Roar keeper Jamie Young failed to keep out Mitchell Duke's shot from distance to get the visitors back level, striker Riera struck twice in the space of three minutes. That put Markus Babbel's team 3-1 up seven minutes before half-time, and they added gloss to the scoreline with Roly Bonevacia's strike in the 93rd minute. Wanderers have now picked up ten points out of a possible 12 since 9th February, though it has come too late to resurrect their chances of making the Finals Series. Babbel left out Alexander Baumjohann and caused a surprise by picking winger Bruce Kamau at right-back. That move didn't pan out too well initially as Dylan Wenzel-Halls turned Kamau inside out before firing a stunning curling shot into the net. Duke brought two early saves out of Young, then with his third shot at goal the keeper made a rare error as he got a hand to the ball but couldn't stop it squeezing under him into the net. Spanish striker Riera met a Bonevacia cross with an exquisite volley that rocketed past Young to put Wanderers ahead 10 minutes before half-time. And it was quickly 3-1 when he converted a simple tap-in at the far post after VAR showed the initial decision of offside was incorrect. Bonevacia's rasping shot in injury time gave Young no chance, to round off Babbel's side's fifth victory of the campaign. The Roar are 10/1 to win their next game against Melbourne Victory, who are 2/7 with the draw 19/4.